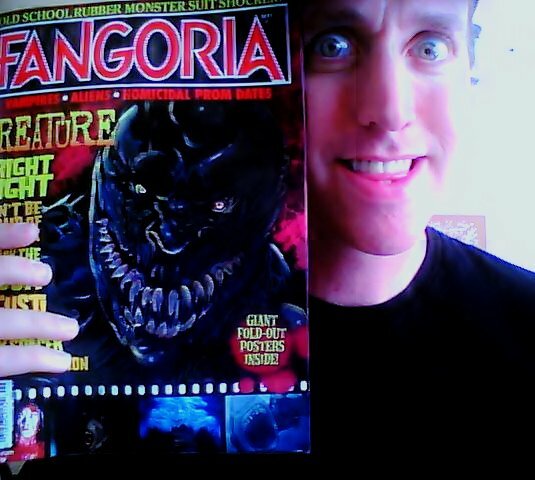 Here we have a chance to talk to Chris Alexander, the Editor-In-Chief of one of the most popular horror magazines, "Fangoria". Q1: How did you get to where you are at Fangoria? I used to write for the Canadian horror periodical "Rue Morgue" and learned my trade, while I also freelanced for other outlets like "The Toronto Star", "Metro Papers", "Dark Side", "Wired" etc. I was also doing music for performance, recording and films and had pretty much centred my life around my driving passion, the obsession over weird cinema. I eventually started freelancing for "Fango" - a dream as I was raised on the mag - and then, eventually phased out "Rue Morgue" Then, suddenly I got the call, inviting me to take over for Tony who was stepping aside after a quarter century. Unreal. Surreal. But incredible and I've been there working alongside Mike Gingold and Bill Mohalley ever since.Three years in January. Q2: Did you take inspiration from anyone to get into publishing? I'm not the publisher of "Fangoria" only the Editor-in-chief, which means I get to have all of the fun planning and writing the magazine while my poor publisher Tom DeFeo takes all the risks. But still, the financial success of the mag is a major concern to me as its success is of course mine so by default, I have an extreme interest in publishing. But as far as writing and being creative in the realms of film and film journalism, it was Chas. Balun, the late, great Chas. Balun whose work in "Gorezone" and "Fangoria" changed my life as a kid. One of the great poets of genre journalism, often imitated - by myself included - but never duplicated. And Tim Lucas, whose obsessive investigations into Euro-Horror also sparked my imagination and interests at a very impressionable age. Q3: I remember you once saying you get sent a-lot of indie films from fans worldwide, what's been the best and worst? I will not name names for the worst - its just not fair as everyone is trying to make art and sometimes it just doesn't work. But the best? Oh man...lots of great stuff out there. Christopher Witherspoon's "Rage" is fantastic, loved this short called "Monophobia" by Scott Perry with Debbie Rochon, a lyrical zombie film called "Velvet Road", plenty of very witty, visoinary speakers of cinema out there with no money who can wrangle their strengths, dodge their weaknesses and make an impact. Q4: I'm sure being in the position you are has many perks, what's been the best experience so far? Just being able to pay back some of the admiration and love I have for the artists I admire and grew up with. I live for exciting, surreal experiences. Being invited to Nick Cage's island in the Bahamas for lunch was unforgettable and absurd. Joining forces with KISS - my all time favourite obsession outside of horror movies - and producing their official magazine was life-changing. Becoming friends with people like Barbara Steele, Harry Kumel, Jenny Wright, my god, man, every single day is an unpredictable adventure, every conversation and connection makes me become a stronger thinker, writer, artist and person. I am spoiled but I work hard so hell, I deserve it! Q5: Like you, I'm a HUGE KISS fan. I couldn't pass up the opportunity to ask, what's it like to work with them? As I said... Crazy. Gene and Paul are fantastic and sometimes difficult as they are very particular but I am humbled before the machine they built. They are wise, and have much lessons to teach but they're also very sweet, honest, warm and interesting people who are sober and always trying to be better people. They are inspiring because in their 60's they never give up, never stop changing or evolving. I am very protective of the KISS legacy because it was the foundation of my life since the age of three and I am just thrilled to be able to have played a part in their work, however small. Q6: Talking of music, do you miss being in the music business? Also how does it differ from doing composing? I was never really in the business, rather it was - and is - a hobby. I still plan to go live again, I'm ready. But making "Fangoria" is very in line with the jolt of performing. You create a piece of work that people respond too and its an instant high that you become addicted too. Q7: What were your favourite horror films whilst you were growing up? Growing up, those films, are STILL my favourite. All the AIP/Price/Poe/Corman films, Romero's "Dawn Of The Dead", Kaufman's "Invasion Of The Body Snatchers", the original "Fright Night", the list is LONG, but at the end of the day, the biggest influence on everything I do is Rod Serling and his original "Twilight Zone" TV show. I was, am and always will be a "Twilight Zone" addict. I want to write a "Twilight Zone" book someday. Q8: Who are your favourite horror actors/actresses? Hammer alumni Lee and Cushing of course, The king, Vinnie Price, Malcolm McDowell classes up everything he walks through these days and I'm never sick of him, Barbara Steele is a goddess, another long list as sometimes you get a great performance in a horror film by an actor who is not known for horror. I think Jessica Chastain is the greatest current living actress and of course, I'd watch Nick Cage read the phone-book and love it. The most entertaining performer ever, I think, love him or don't. Q9: What's your views on the current state of the Horror genre? Horror is alive. It's thriving. Every country is spitting out stuff that is diverse and interesting. Hollywood horror is hit or miss, but it is ALWAYS hit or miss and really, it's all a matter of perspective. Gene Simmons said to me "your perspective on the ride depends on when you get on the train." That is 100% true. Horror is subjective, all a matter of taste. And as a horror fan, life-long, I have learned to love "moments" or eccentricities more than gore, gore is easy, you need to surround it with something sublime for it to be memorable. I want the fantasy, the strange, dreamlike. Sometimes I can find that in movies that aren't horror. "Drive", for example, or "Melancholia" or "Antichrist", movies that have horror and a kind of haunting poetry in them but are operating outside the narrow parameters of what many "fans" define as horror. Q10: Have you got anything in-store for us in the future? ALWAYS. 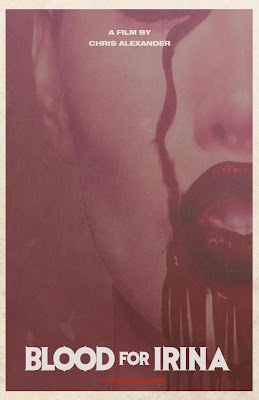 I made an art house, no budget impressionist vampire film called "Blood For Irina" that is doing fests and will be released next year. I wrote, directed, shot, scored and edited the film with a small crew. It was financed by Autonomy/TLA and its not for everyone but I like it. I'll definitely be making at least one more film. "Fangoria" has some berserk, out of the box ideas and concepts around the corner, there will be side mags and other fun stuff I'm doing both with "Fangoria" and outside of it. Q11: Do you have any advice for anyone wanting to follow in your footsteps? Just never, ever let go of the things that make you happy. I tell my kids that they'll never have to put away their toys if they don't want to. I never have and its paid off. Q12: Do you have any last words for anyone reading this? Stop reading this and do something productive already! Hahaha.